MERCEDES, CAMARINES NORTE—A misunderstanding between brothers turned brutal when the younger one fired a gun at his brother in Purok 4, Barangay Lanot in this town the other day. 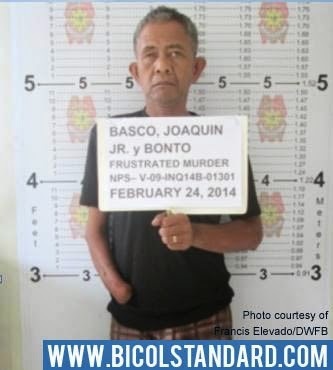 The victim was identified as Francisco Basco, 60 years old, and a resident of the same barangay. Basco sustained a gunshot wound after his younger brother, Joaquin Basco, 50, from Barangay Aldisar, Sipocot, Camarines Sur, fired a gun at him while the latter was in a drinking spree. According to the initial investigation, the younger Basco, who was drunk, confronted his older brother. The two engaged in a heated argument that ended with the suspect shooting the elder Basco. The suspect fled the scene, while the victim was rushed to the Bicol Medical Center in Naga City, for treatment.